"Hasta went forward to discover the meanings of the Strange Happenings which occurred but weeks before. 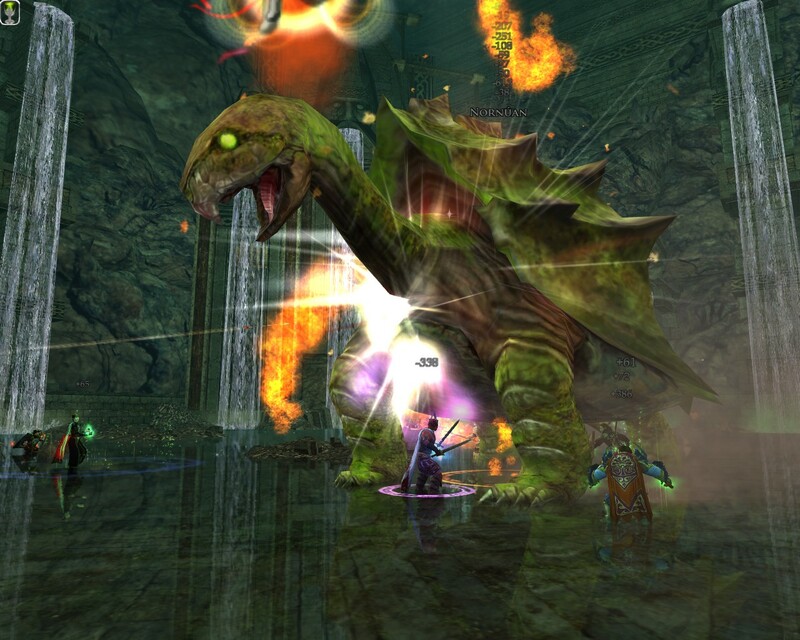 He has not returned, and his companions are becoming worried that something may have happened to him..."
The Turtle is a straightforward DPS-race tank & spank, and is the main source of Bright Emblems of Nimrodel for lv59/60 First Age Legendaries. The Turtle is a lv58 instance, and has locks which reset Daily. The two tanks will be expected to hold agro, and switch agro between them at intervals, and will need to be prepared to do this regularly. Healers will be healing as usual, however during the later stages of the fight the group will be taking massive AoE DoTs. The tanks will also additionally be taking large single-target DoTs, so a large healing ability is recommended. Legendary Traits such as the Minstrel's Fellowship's Heart and Rally, and the Rune-keeper's That Which Does Not Kill Us are highly recommended to be traited. Will be expected to buff the raid, and be ready to provide off-healing if a member of the raid (particularly tanks) are in danger of dieing. Will be expected to keep the Turtle debuffed at all times, and then assist with DPS. You can't stop the DoT's being applied, but increasing your Poison resistance will help to resist each tick of damage. Nornuan has an acid aura affecting everyone in the instance. The damage caused by this steadily increases at fixed time-based intervals during the fight. Nornuan will inflict a single target acid DOT on his agro target with his "Snap" attack. Once the agro target has this DoT on them, each following "Snap" will increase the damage-per-tick on the DoT, and refresh its duration. This means that tanks need to swap agro or they will get DoT's of over 4k per tick, and quite simply, die. Nornuan occasionally does an AOE attack which sends spikes flying in all directions. This cannot be prevented, and causes damage to the raid and interupts inductions. After performing a ready check the raid leader should step into and then back out of the room. This will cause Nornuan to charge towards the group and then reset. This gives the group ~1min to enter the room, deploy any traps/oils etc and prepare for battle before Nornuan respawns. When Nornuan spawns in the middle of the group, the Main Tank should pick him up and build agro. The rest of the raid should start with some light DPS. After 10-15s the tank should have comfortable agro. Everyone should now switch to maximum DPS. Captains can use Oathbreaker's Shame and To Arms (Blade-brother) if they have them to help with DPS. When the tank's acid DOT reaches over 1k per tick, the off tank should take agro. Force taunts can be used in the meantime to keep agro off the main tank so that his DOT does not build any higher. The objective here is to keep agro off the main tank until his single-target DoT has expired. Once the Main Tank has lost his single-target DoT, he should immediately try to take agro back so the Off Tank can reset their own DoT. The tanks will then continue to swap agro to lose their debuffs for the rest of the fight. As the fight continues, the acid aura around the boss will increase over time. If you take too long, this will start to cause massive damage and approach unhealable. Keep maximum DPS on the boss at all times. Loremaster(s) should ensure that healers and tanks have as much power as possible, and then power anyone else at their discretion. Nornuan should die in approximately +/- 4 minutes for an on-level balanced group. There are no deeds associated with the Turtle.